This is a guest post from Dustin Christensen. 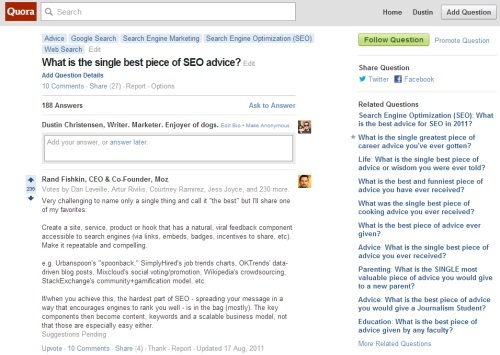 Could Quora, a Q&A site, help you build a more popular blog? This is something they do by combining the informational aspect of Wikipedia with social media capabilities like upvoting and easy cross-platform sharing. But the site also serves another function, particularly for bloggers: it’s a goldmine of content opportunities. Covering questions from the highly personal to the broad and practical, it’s the ideal platform to find new content ideas, get in touch with subject experts and expand your own blogging presence. Sites that now post content originally found on Quora include huge ones like Newsweek, Slate, Forbes and the Huffington Post. Although keyword research is an important part of your blogging strategy, it’s not the only way to come up with ideas – you can take a look at topics too. For instance, on Quora, the topic “blogging” has nearly 50,000 followers, and the topic “Blogs” has more than 73,000. With this much engagement, there’s bound to be ideas that you’ve yet to cover on your own blog. A good way to find popular post ideas is to view the Top Stories from a Quora topic. Chances are, you’ll come across topics and areas of interest that you haven’t considered, and with enough research, you’re likely to find enough potential ideas to fill your editorial calendar. Tip: The best questions to base your content on are often those with the most answers or followers, or those that have been answered by well-known experts. Essentially, you’re looking for the topics with the most engagement. Don’t stop there – you can dig even deeper to find additional long-tail content ideas. Consider this Quora question: What are the best pieces of golf writing? You could get several potential posts from this question by referencing books, magazine articles, how-to tutorials, blog posts, news stories and other pieces of writing. To start, you could blog about the top 10 golf books ever written. Go to Amazon, look through the bestsellers in the sports section and find 10 books that are selling well. Write a blurb on each, maybe quote parts of a review and if you’re really diligent, read the book yourself to add your own take on it. You could just as easily do a “best magazine articles on golf” and do the same thing, finding popular articles from golf and sports magazines and writing a compilation post. There’s a book collection called The Best American Series that puts out “best of” books every year, and there’s one called Best American Sports Writing. With these types of blog posts, you’re simply mimicking this format: presenting the best of the best, with your own spin and value so that you’re adding something unique as well. Tip: In addition to Quora, use your keyword tool of choice and even social media search tools to see what else people are saying about your topics and long-tail ideas. One of the most appealing aspects of Quora is the high-profile users that answer questions on the site (including Mark Cuban, Ashton Kutcher, Stephen Fry, Steve Case and many more). For bloggers, this represents an amazing opportunity to get in touch with experts on a platform they’re interested in. Quora allows you to follow and message other people within the site itself, but more importantly, you can also find these people on other social media platforms. And chances are, if they are willing to respond to questions on Quora, they’ll be accessible in some form, whether it’s Twitter, LinkedIn, Facebook, email or their own blog. This tactic is great when you’re writing specific, in-depth articles that require unique and expert insight. But it’s also effective for posts that require the opinions of many people at once. You can contact experts, let them know that you found their Quora answers helpful and ask if they’d be interested in commenting on a similar topic for your blog. Not only will you be creating more valuable blog posts for your readers, but you’ll also be building your personal network and improving your connections within your niche. Quora has proven itself to be the rising star of the Q&A niche. It presents to its audience practical questions and insightful answers. With some time, research and brainstorming, you can turn Quora into a rich source of original and valuable blogging opportunities. And why not take it further by participating yourself? Quora can help define you as an expert in your own right, and prove to be a valuable source of traffic to your blog. Will surely follow your points. I have been in Quora for a long time. And just now started with posting blogs. The tips which you have be listed would be really useful for me ti improve my blogging. Many many thanks for sharing this knowledge stuffed useful very useful post. I was absolutely not aware that even Quora can help so much. Thanks for this interesting piece of information, this will surely help me a lot. I have heard a lot about Quora but never tried it personally, nw after reading this I have realized about the importance of Quora and the opportunities I have been missing..Thank you for crafting such an informative post.